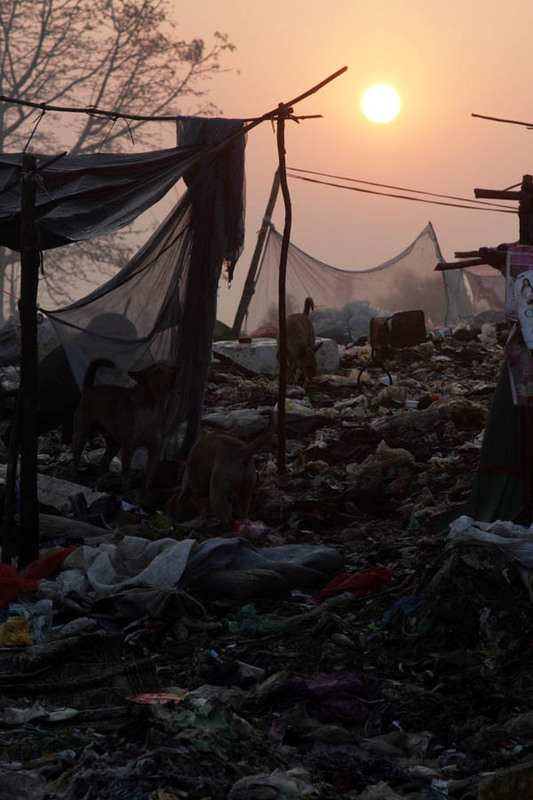 On January 26th, we returned to the dump again to visit and see how people were doing, as well as to speak with a number of people who had medical problems. 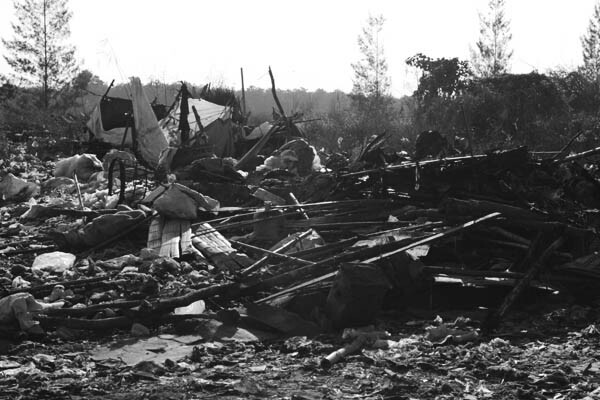 If you read the last few posts on this blog, you saw a photo that showed most of a row of homes still standing after the majority of the homes on the dump were destroyed. This is a photo of the same row of houses. 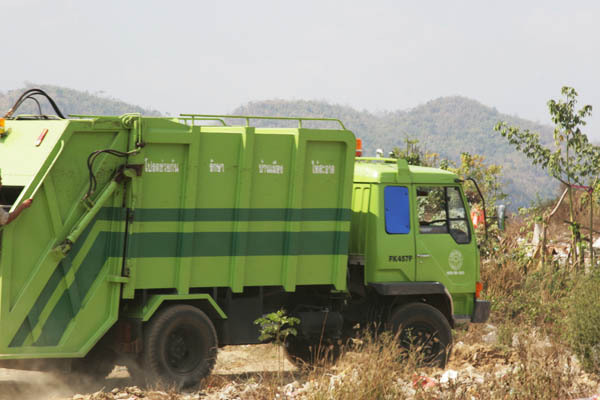 The trucks keep coming, though, so many of the dump residents return and try to eke out a living despite the risks they face with the Thai police. 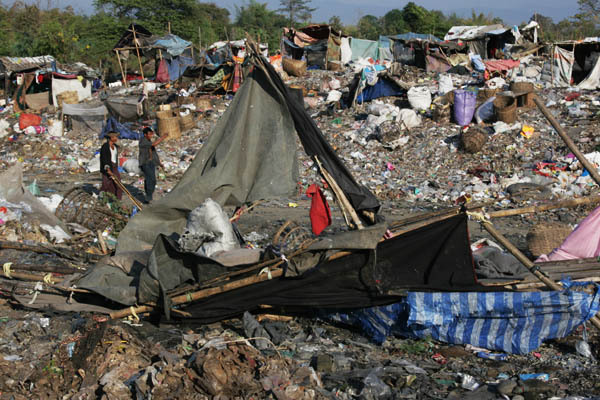 After all, there’s a reason they chose to live on a dump rather than remain in Burma. 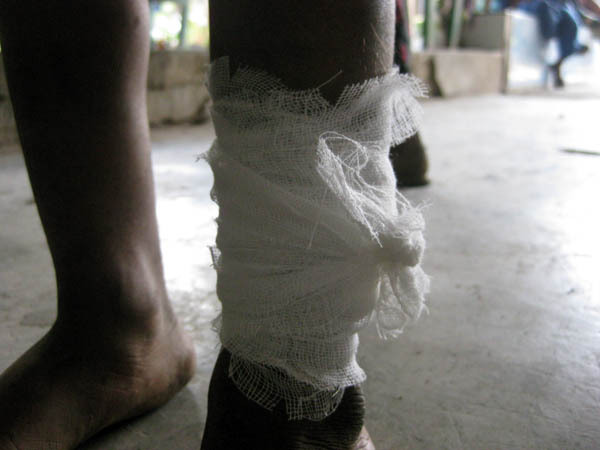 After being treated at the clinic, his leg looked much better and he said it was much less painful as well. 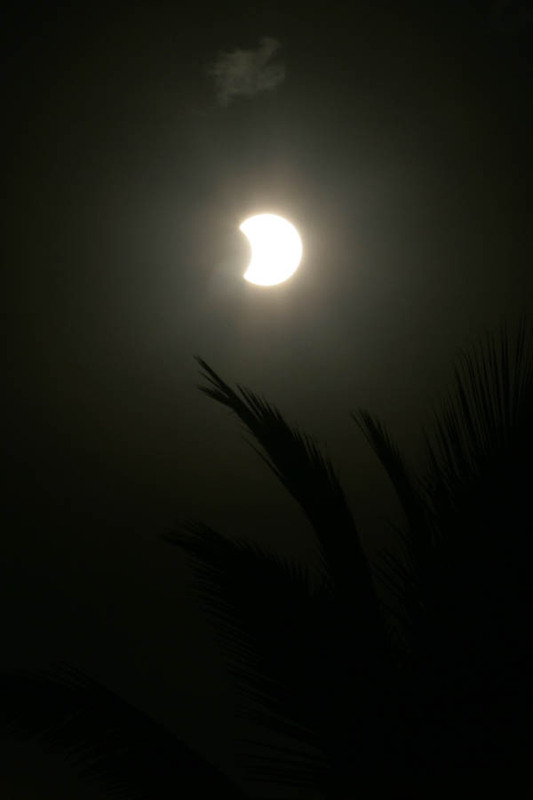 Later that afternoon, my favourite restaurant employee told us that there was to be a partial annular solar eclipse that day so I googled it and found out what time it would occur. At the midpoint of the time range, when the moon was covering the biggest area of the sun, I took this photo. If I had been in the precisely correct part of Indonesia or the ocean, this would have shown a thin white ring around a black circle. In the afternoon (same day as the last post), it was time to de-stress a little with a relaxing activity – golf at the driving range! 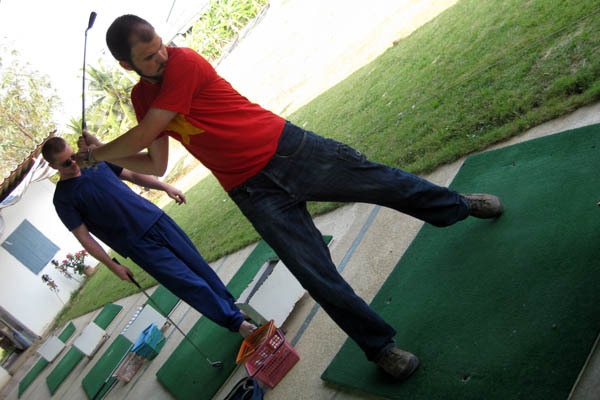 Yes, Mae Sot has a driving range, and the locals are too smart to use it in the midday heat so Pieter, Gareth, and I had no problem finding spots. None of us are golfers, but at the driving range, our main goal was just to hit the ball as far as we possibly could, using as much brute power as possible, rather than focusing on perfecting our technique. My downswing looks more like a hockey slapshot than a golf swing, but I was hitting 150-200 metres regularly, and we weren’t even using drivers! Not bad for our standards! Gareth gets mixed up on occasion and launches the golf club rather than the ball. Luckily no one was hurt and the club was undamaged. He nearly made the 50 metre mark! Back at the guesthouse, another guest kindly shared some of this crazy, crazy fruit with me. It’s really tasty! You just take the outer casing off, and it’s very similar to lychee inside (in fact, it’s closely related). 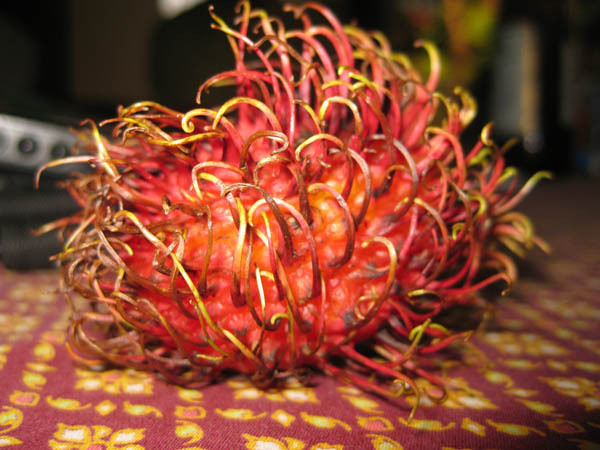 It’s called Rambutan and you should eat it if you see it. It’ll make you happy. Here’s a random photo from a different night. 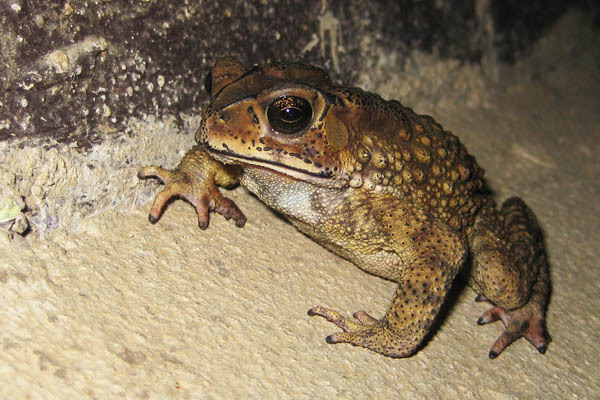 It’s a toad that used to come by once every evening for a while, then stopped visiting, which means he’s probably on display in the window at someone’s local taxidermist in Australia. 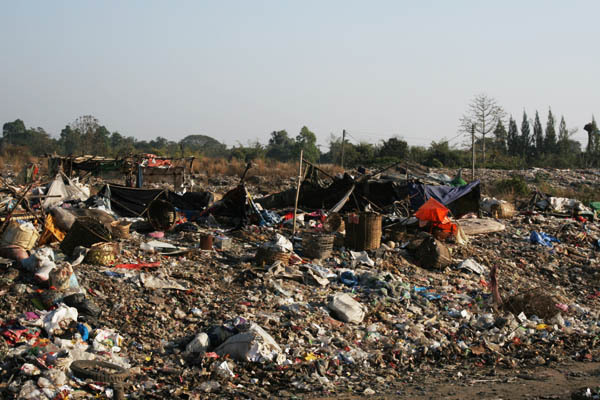 The last post, 2 days ago, was a very short look at the Mae Sot garbage dump in Thailand. 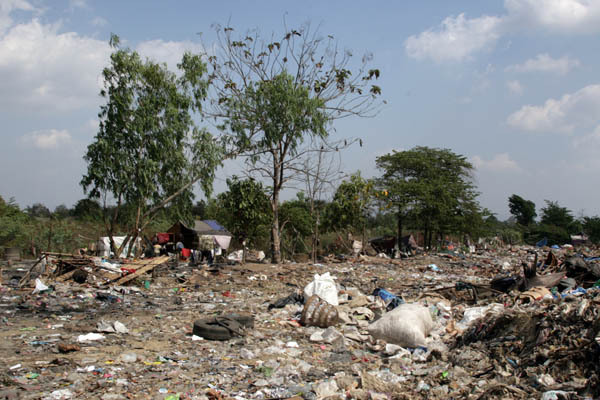 The problem with the people living on the dump (when I say “on the dump” I really mean it literally – most of the homes are actually on the piles of trash) is that they have no documents permitting them to be in Thailand. 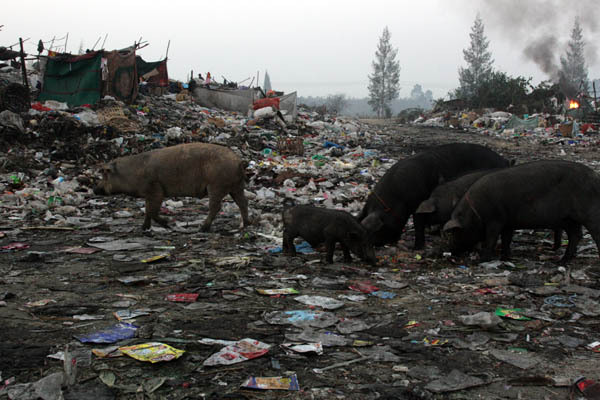 They live on the dump for a reason: it’s better than the life they left behind in Burma. 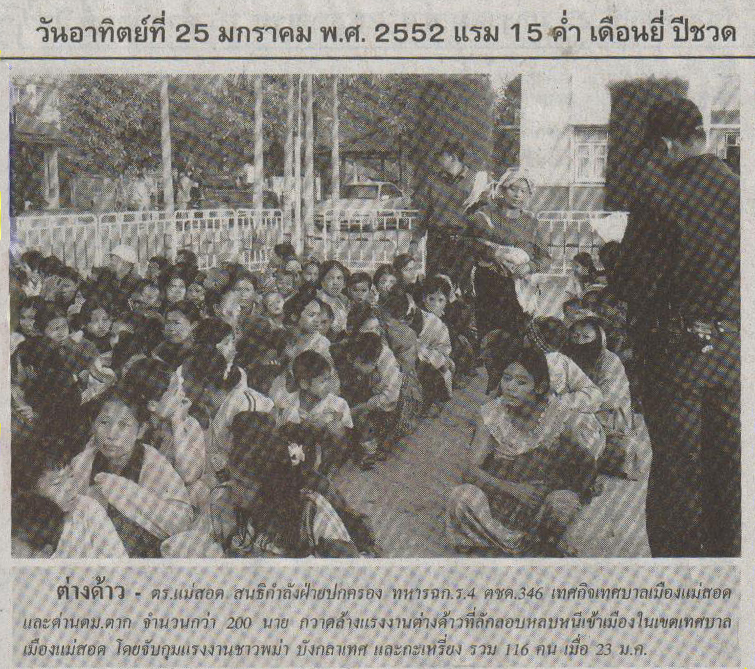 For a number of reasons, which are far too complex for me to explain in a concise blog post, the Thai police regularly arrest ‘illegal’ Burmese migrants in Thai cities and deport them back to Burma. 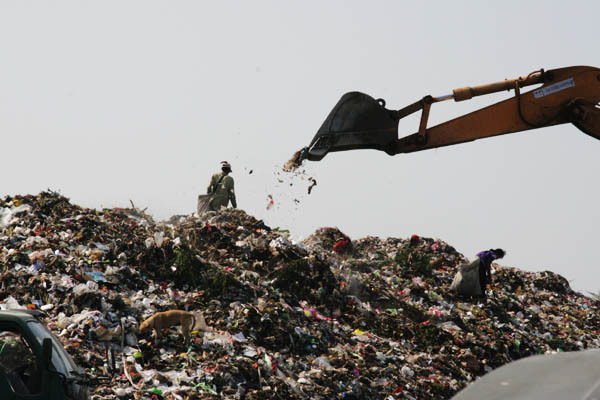 The dump has not been the regular focus of police efforts, until recently. 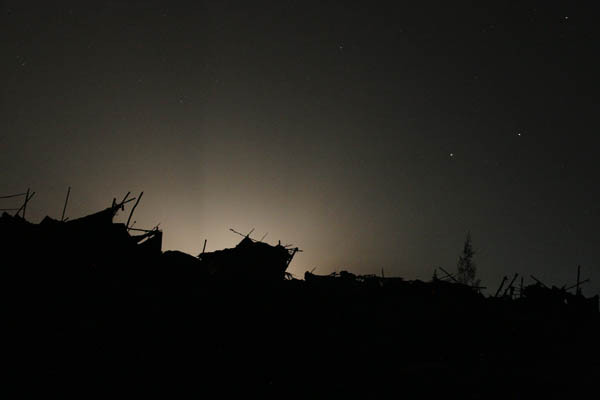 On January 23rd, my friend and I found out that the police had raided the dump site early in the morning and arrested any inhabitants who weren’t quick enough to run away. They took the arrested people to the police station, where they sat them down in rows outside, and eventually drove them in a caged truck to the border crossing nearby where the migrants were handed over to the Burmese authorities. 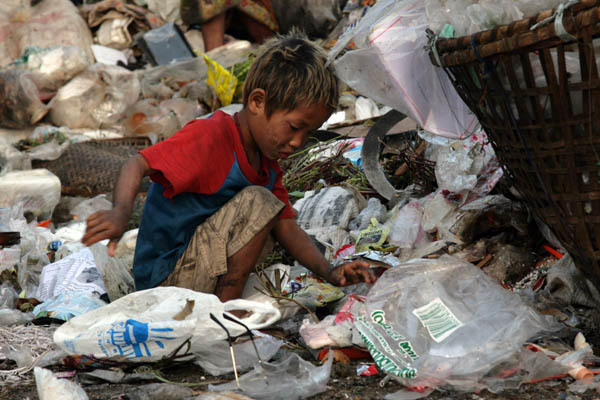 They were given no food during their detention in Thailand, and we found out later that they were also given no food during their detention in Burma, despite many toddlers and young children being among the hundred or so people arrested. Of course, there was no news story to go with it, just the caption. The official story was that they were illegal migrants who had crossed into Thailand and were working in the city, whereas we had met a number of the people recognisable in the newspaper, so we knew better. 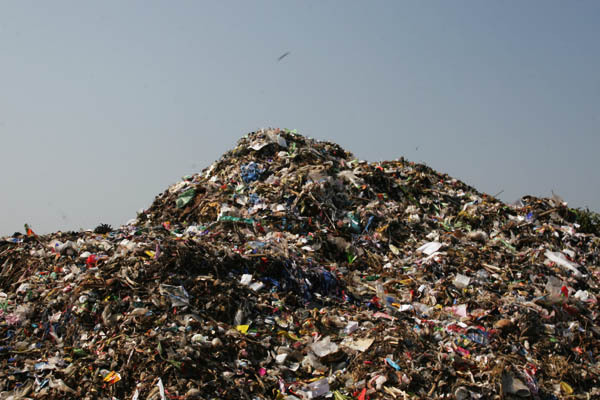 The following are a few photos of what the dump looked like on the afternoon of the 23rd, after the police had left and a few of the migrants had returned from their hiding spots. 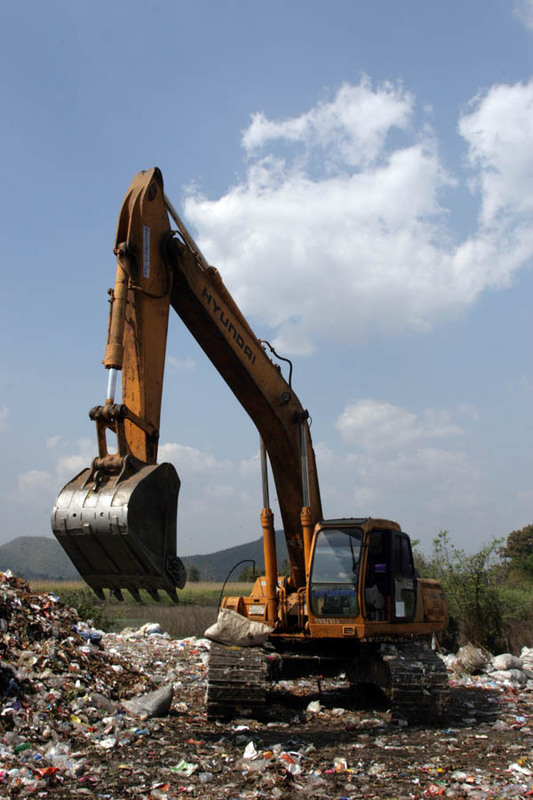 As I mentioned in the last post, the Hyundai excavator normally used to keep the trash organised, was used for something else this time around: to destroy their homes. Here’s the “theatre” that was demolished. 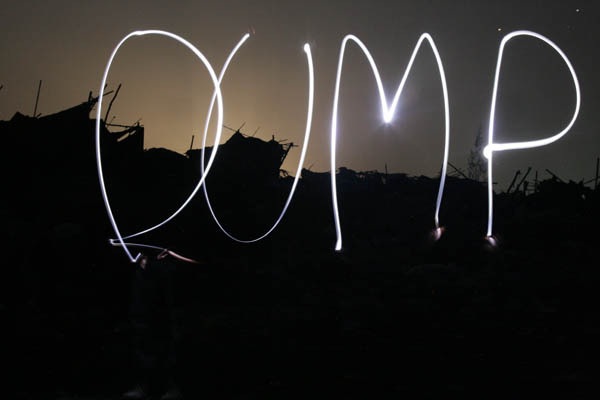 The dump residents had saved up to get a generator to show videos on occasion, mainly for the children, a huge expense to try and add some normalcy to their lives, and something of which they were immensely proud. The police stole the generator, fuel, television, etc. Homes partly demolished. The excavator simply punched them in from the top, causing them to collapse. 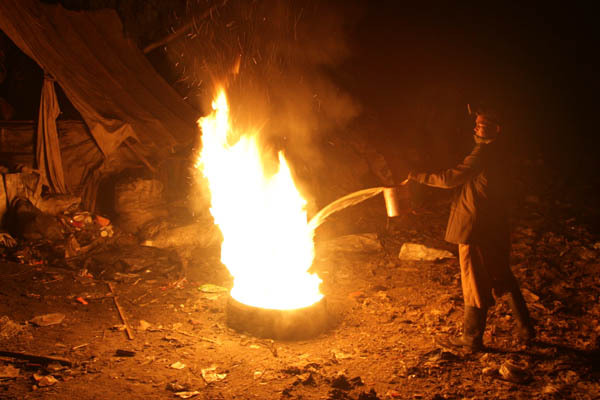 Of course, that was after the police kindly stole any food items, electronics, cooking equipment like pots and pans, from the homes. Some of the homes in this row were left standing, supposedly because of confusion over a property line nearby, not wanting to upset the owner of the land. 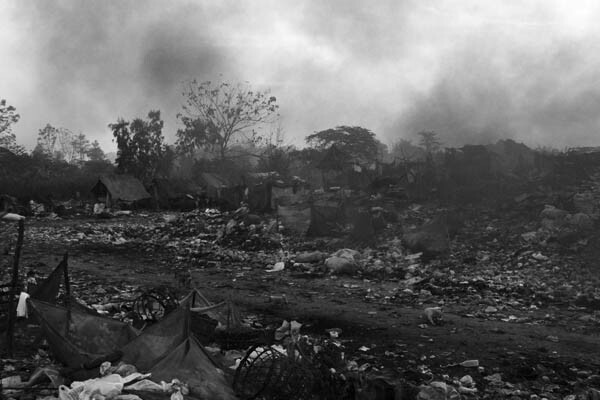 The home in the foreground and some of the homes in the background were demolished, and the residents’ few belongings lay strewn about, left in the frenzy of trying to run away. 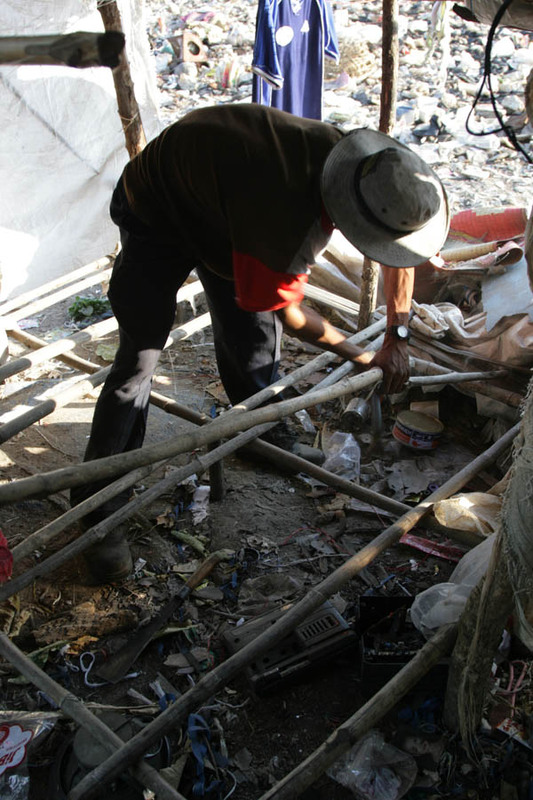 This man was able to avoid arrest and is disassembling his home, to take the useful parts with him back to Burma. He will try and start over again in the jungle there, and hope for the best. 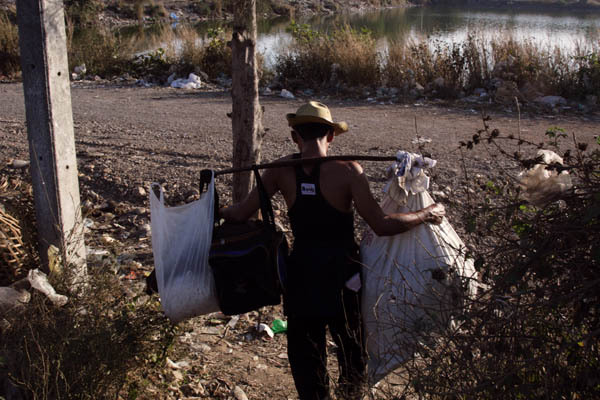 This man has loaded up everything he can salvage and is walking back to Burma. 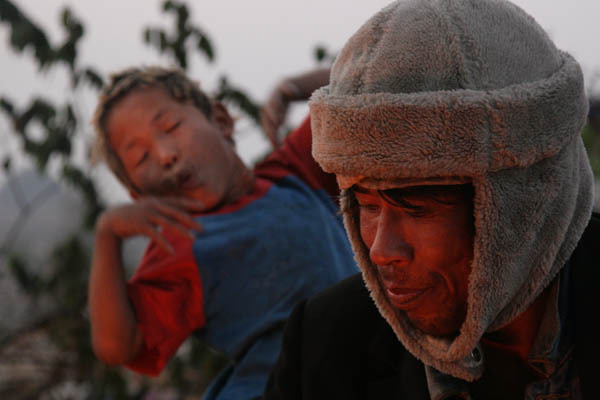 He’s tired of the treatment in Thailand, but doesn’t know whether life will be any better in Burma, which he left because of the impossibility to earn a living and the danger ordinary people face at the hands of the Burmese authorities. We talked a lot with the few people who were around in the afternoon, and they asked us to return and spend the night, in case the police came back (they threatened to burn all the houses, and had even brought a fire truck with them on the first raid), to witness and perhaps moderate the potential for excessive use of force by the police. So we left, bought some food for ourselves and the small number of people who would be staying on site at night (most of them went into hiding at night), and returned. 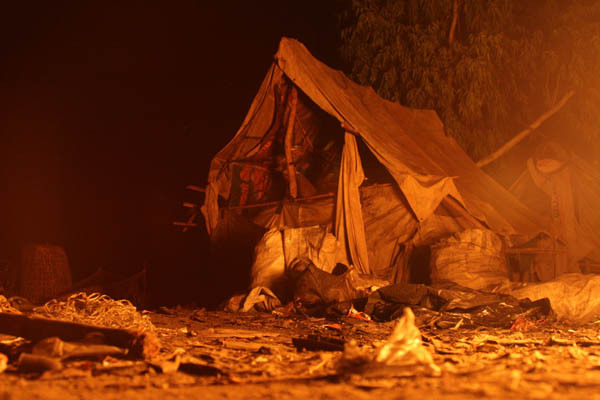 We slept for a few hours in someone’s home that hadn’t been destroyed, though the family wasn’t there. 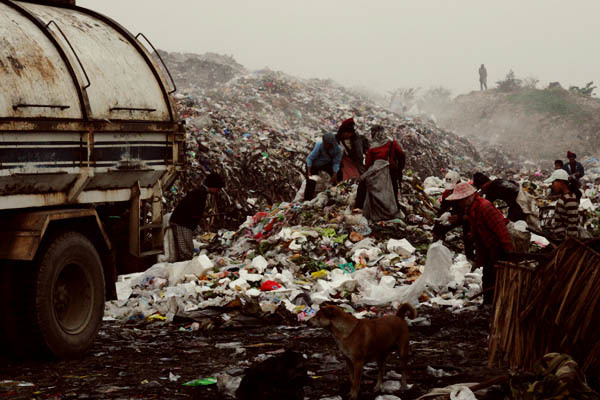 At 4am we got up and went to the ‘central’ area of the dump to sit around and wait, and hoped that we were waiting for nothing to happen. 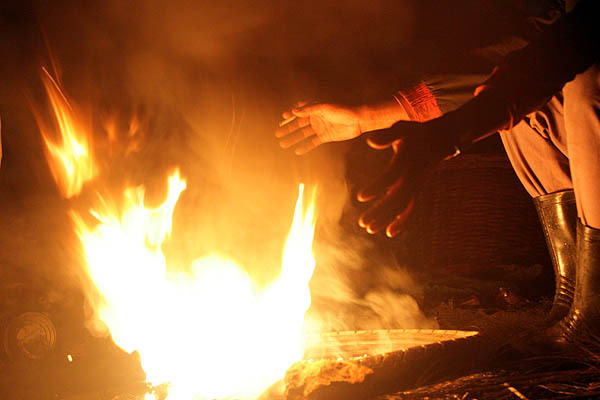 This young man woke up and started a fire around 5am to warm up (it gets very cold at night in Mae Sot in the winter). 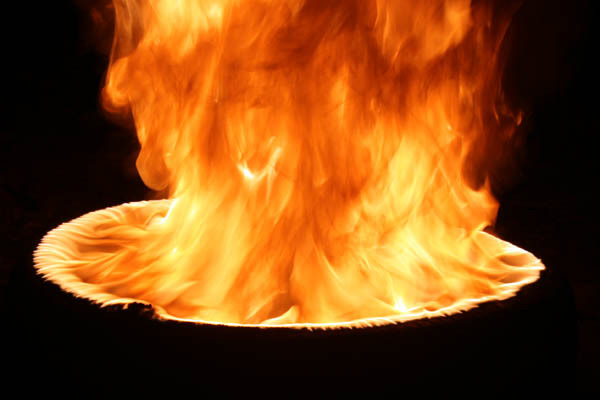 There’s no shortage of old tires, which burn very well once you get them started, though the black rubber tire fumes are probably terribly unhealthy. 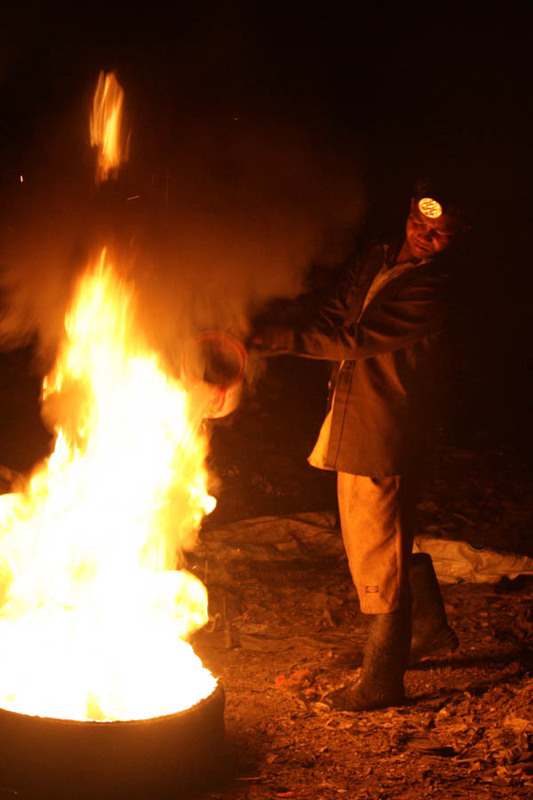 He kept the fire from getting too big by throwing water on it occasionally. 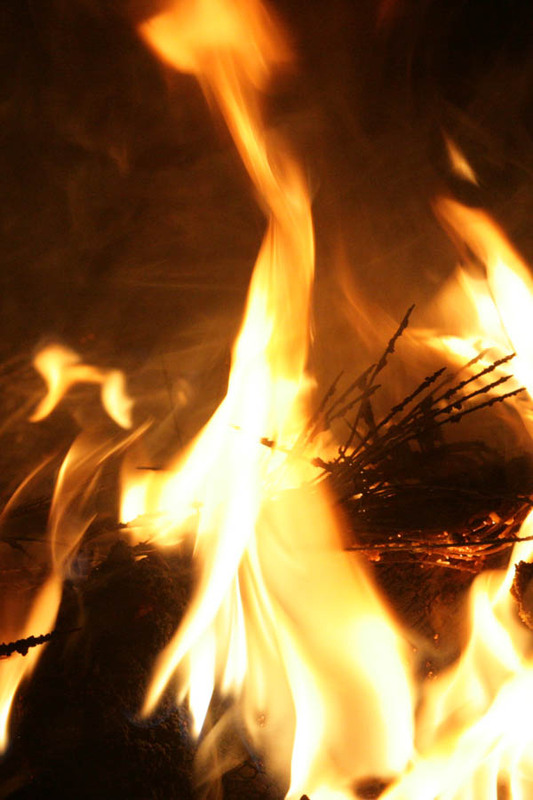 Another fire close-up. The wires are from the tire. The dump is littered with these fine metal wires which tried unsuccessfully to trip me constantly. Two 30-second exposures. The second one is me with my headlamp, and my friend pushing the shutter release on my camera which was resting on the Hyundai excavator track (the linked plates on which it rolls). Normally, when a garbage truck arrives, there are quite a few more people to sort through the new delivery, but many were still in hiding. 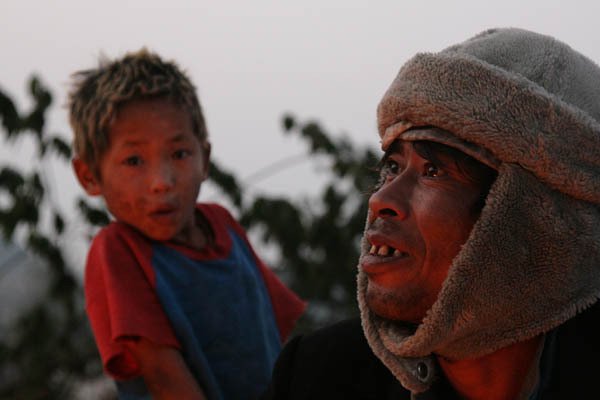 The good news is that the women and children held in Burma were released later the same day. 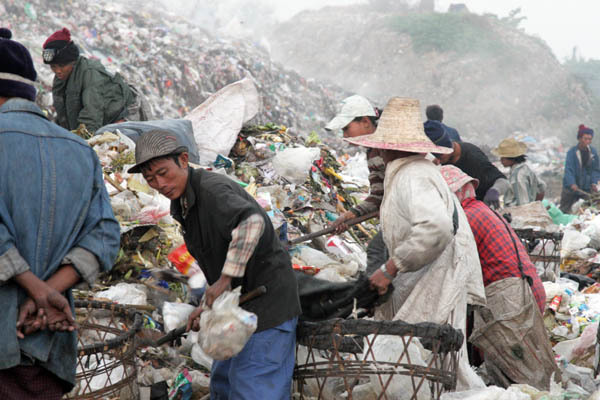 Most of them then walked back to the dump, which took quite a while. The men, however, remained detained, and I don’t know even now whether or not they were all released eventually. There’s a long and complicated story that follows this event, but you’ll have to ask me in person to find out the details, as it’s not really suitable at this point in time to be telling the whole story online. 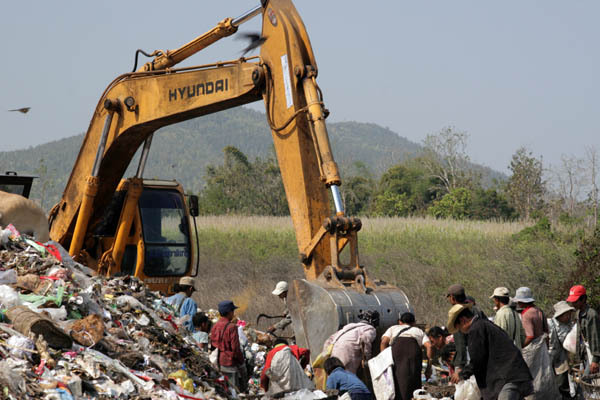 In a previous post in January, I posted a downloadable large-size photo of the dump in Mae Sot, Thailand. 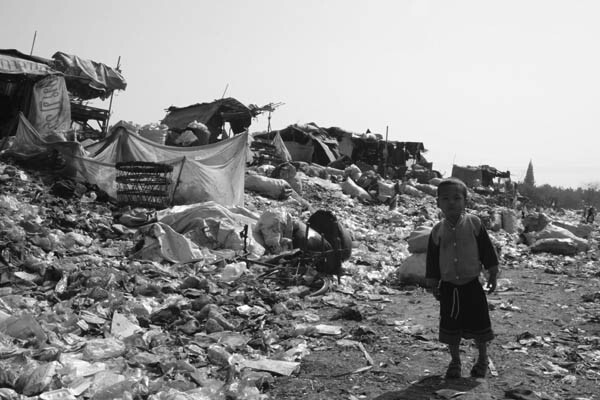 It is/was (the ‘was’ is the subject of a post to come in two days’ time) home to many migrants from Burma, who pick through the trash to find recyclable plastic and certain types of metal, which they take to a depot to earn a minuscule (and I really mean minuscule) amount of money. My friend is making a documentary film about the situation, and he asked me to join him to help out a bit and take some photos as well. 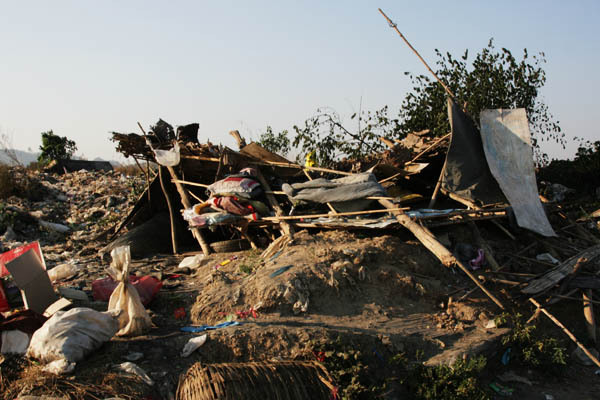 We met many of the dump inhabitants who shared their stories and the problems they encounter with the Thai authorities, as they are undocumented migrants. 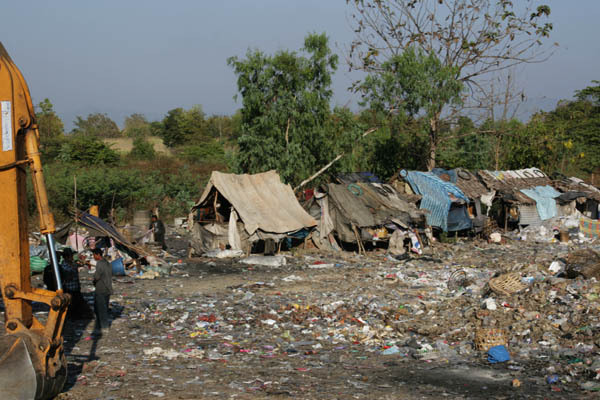 They want their story shared, even though there is a risk that more attention will increase Thai authorities’ efforts to ‘solve’ the ‘problem’ of Burmese migrants, as they see it. 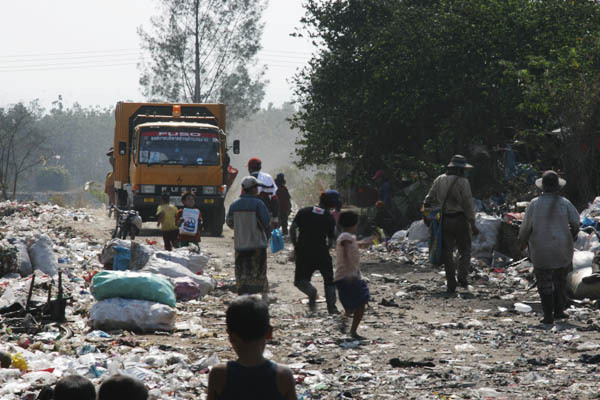 There were a LOT of people living at the dump, around 300 according to many estimates. 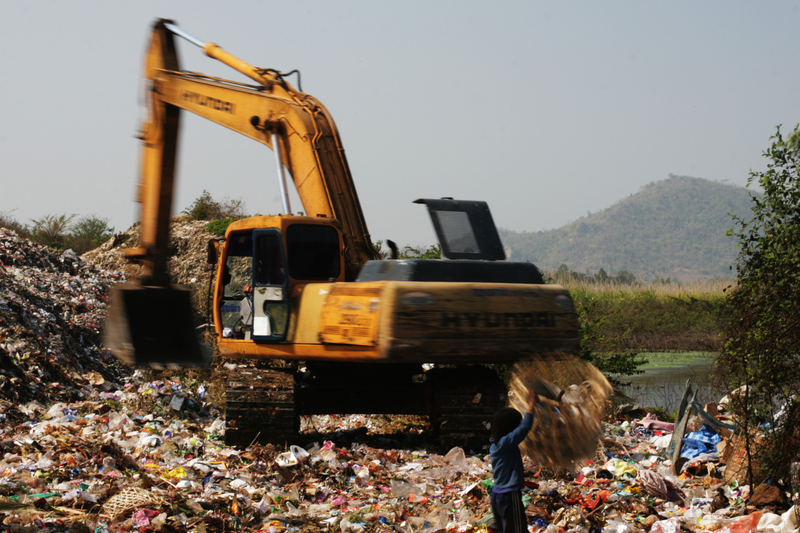 After trash has been delivered by garbage trucks, the Hyundai excavator moves it onto the massive piles of garbage that rise skyward.